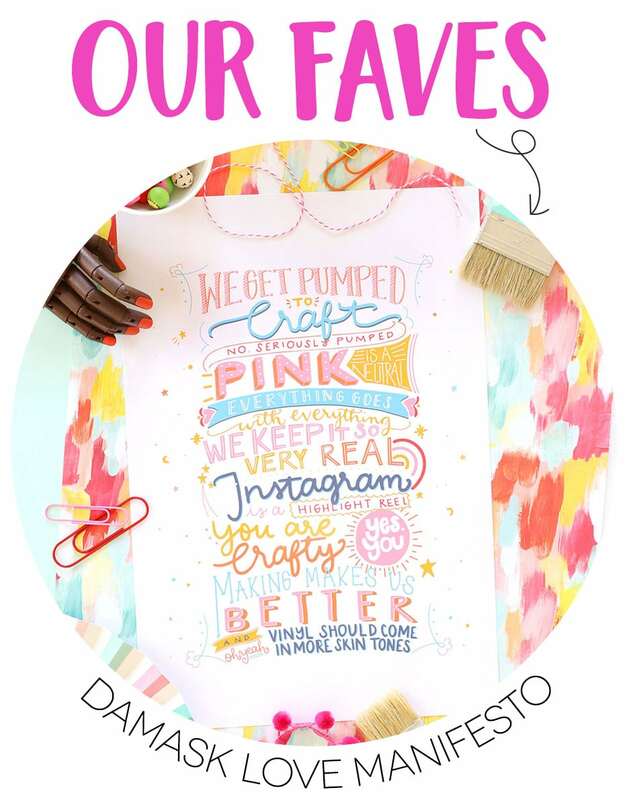 There are lots of tell tale signs that you’re a crafter. Like when you find adhesive squares in your bed – and it’s no big deal. Or when you always have glitter specks on your face. Or when the transaction history on your credit card looks like this: Michael’s. Michael’s. Joanns. Container Store. Container Store. Joanns. Hobby Lobby. Container Store. Michael’s…you get the idea. 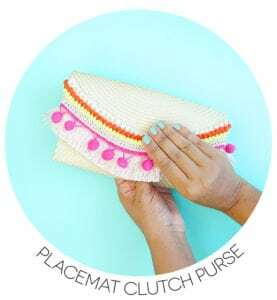 The last of these is true for me, especially since I started tackling Crib Meets Craft. If you’ve been following the #cribmeetscraft hashtag on Instagram, you’ve seen peeks of this process over the last few months. I’ve taken “nesting” to a whole new level which means I’ve spent lots of time organizing and labeling and neatly putting things in their perfect place. 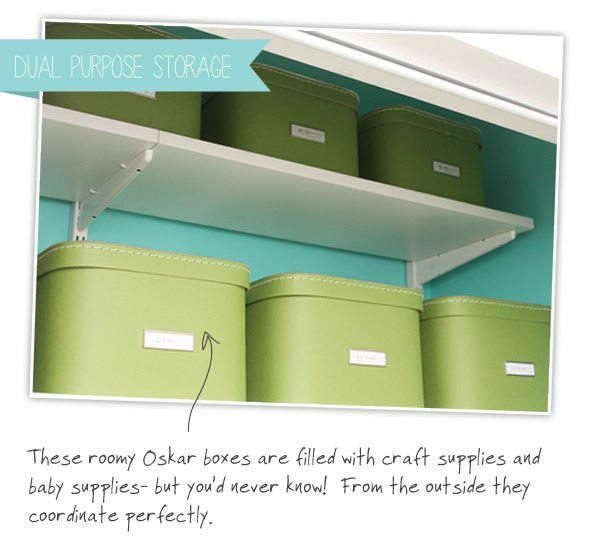 Hallelujah for my new best friends at The Container Store who helped me through every step of my Crib Meets Craft closet organization project. 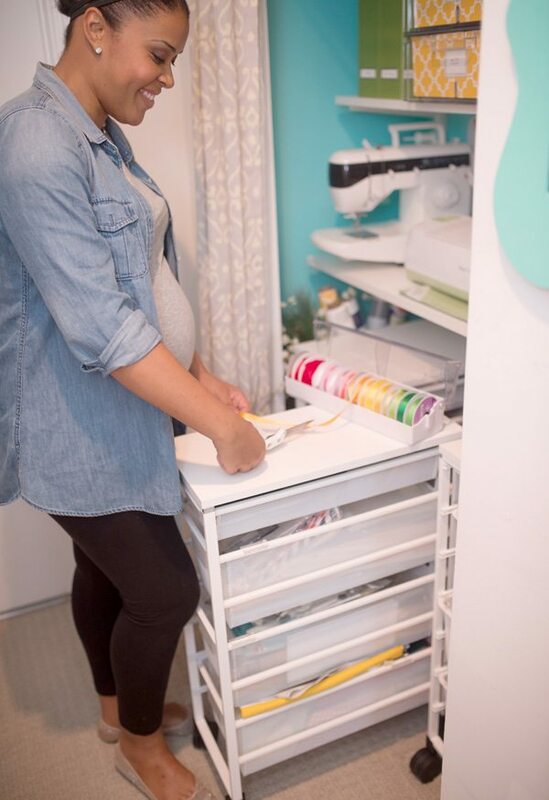 With a baby on the way, I knew I had to tackle every nook and cranny of my craft space and make it functional for me and the little sugarbooger. This meant giving some much needed attention the sad, disaster of a closet that had long gone neglected. Before The Container Store swooped in to save the day, the closet looked like a rat’s nest. Like the inside of Oscar the Grouch’s trash can. Like the …well…how’s about I just show you. 1. See that folding door? It totally got in the way. With space at such a premium, that door was a big problem. Even when it was open, it took up about 4″ of space in the closet opening which meant I couldn’t fully open the plastic drawers inside. 2. The hanging bar was another problem. It was the perfect height for hanging clothing but when it came to storing boxes and supplies on the shelf portion, it was a little unstable. 3. Ugly boxes galore! This is what happens when you have too many supplies and too few places to store them. Things end up being stored in cardboard boxes and stashed wherever they’ll fit. Now, there is nothing inherently wrong with cardboard boxes, but when you love pretty things the way I love pretty things …cardboard boxes are just not cool. 4. Stacks on stacks on stacks. This was probably the biggest problem. Here’s the thing: once you stack more than 2-3 boxes on top of each other, the configuration becomes pretty non-functional. If you need to grab a box, you have to move the other ones…and sometimes they topple over…and then you get annoyed…and then you avoid putting things back where they belong because it’s such a pain…so everything ends up in a huge mess. 5. Nowhere to store my props! If you’ve read the blog for a while, you know how much I love to style photos with seasonal props. Those props need a home and in this previous set up, their home was the floor. They often got in the way and made it impossible to close the door all the way. See the problem?! 6. On the other side of the closet is where I stored the baby stuff, including the world’s most adorable seersucker suit which I purchased at Macy’s for $6…but I digress. 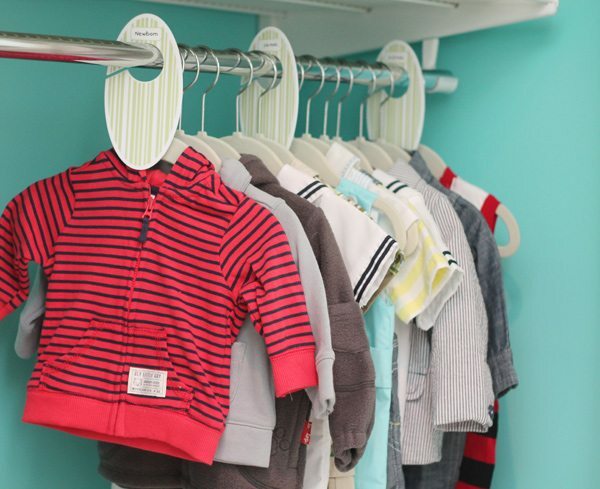 This closet bar was also a problem for baby clothes because it left a ton of empty space below. 7. Stacks of more boxes! Argh. See #4. 8. Too many baby toys jammed into too little space and waaaay too disorganized! 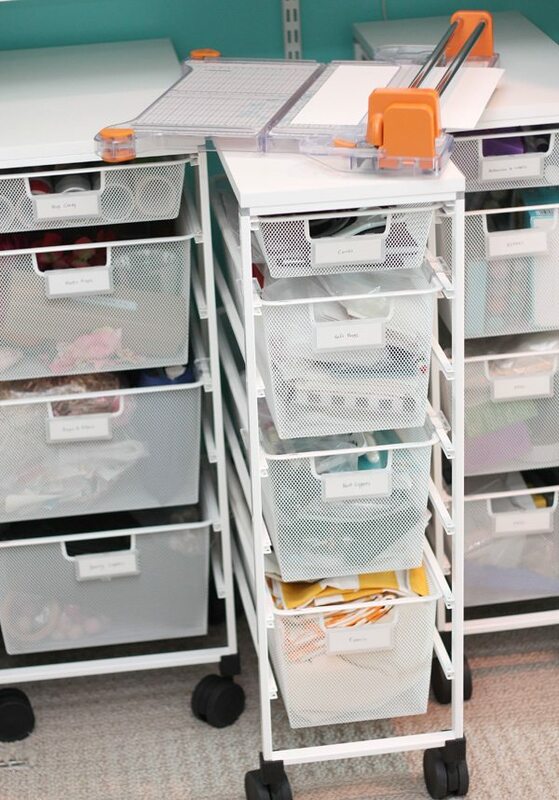 I established the problems…so the next step was to take all my measurements to The Container Store where the Elfa geniuses worked their magic and designed a way more awesome space that would work for all of my needs. It took about an hour to design the entire space, including the time they spent helping me decide on which storage drawers and boxes would be best. I was beyond impressed with the patience and knowledge of the staff at my local store. They thought of EVERYTHING and had a solution for every snag. With the space designed, I had our friendly handyman remove the previous closet rod, patch the holes and paint the interior of the closet in a fun shade of blue. 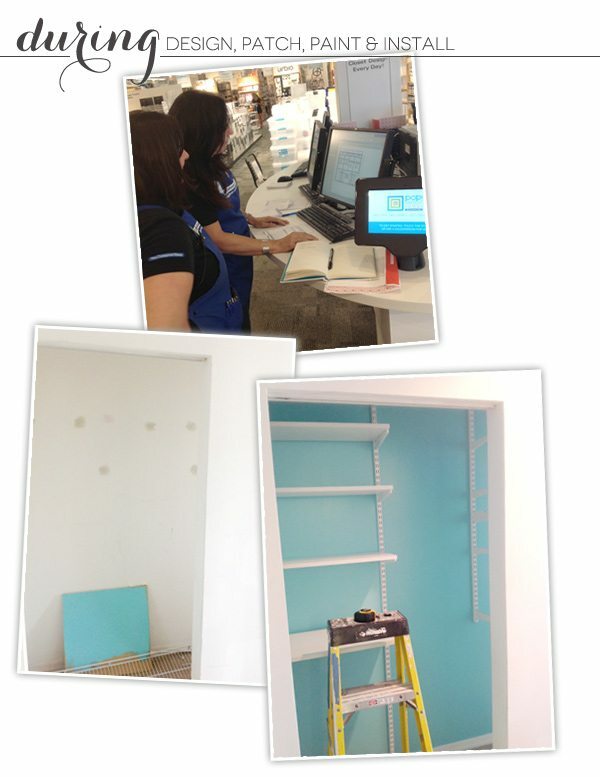 The last phase was installation which was offered by The Container Store! Thank goodness…because Lord knows this pregnant lady had no business trying to tackle that task! They came over and installed all the shelving and drawers in the matter of 90 minutes. It was like watching magic happen. Now for the fun part…the after! 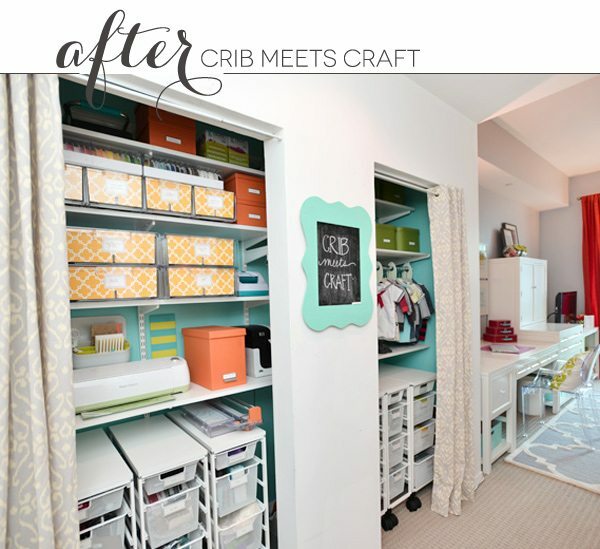 The final closet space includes a varied collection of Elfa shelving and drawers that are functional for baby supplies as well as for crafting supplies. Let’s take the grand tour, shall we? 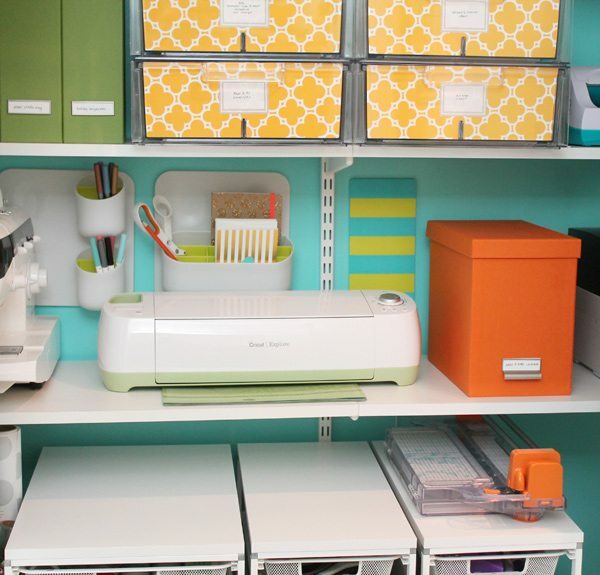 The left side of the closet is dedicated to crafting with a shelf that holds all of my large electronic supplies like my printer, Cricut Explore and my sewing machine. I love that my Cricut has a permanent home and can be used without moving it to another spot. For this shelf, I used the Elfa 16″ deep white melamine solid shelving. On the shelves above the electronics, I’ve organized my ribbon, envelopes, felt, stickers, adhesives, inkpads, letterpress supplies…and more! It’s pretty unbelievable how much stuff can be stored in the Clear Shirt Drawers and Clear Shoe Drawers. I was especially excited when I realized that I could store fifteen HUGE spools of ribbon in just one of the Clear Shirt Drawers. 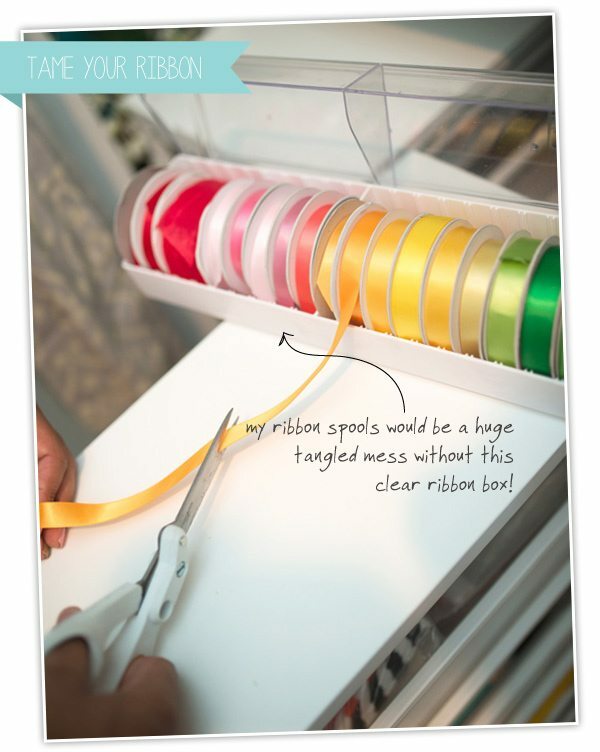 The dividers make it easy to keep the ribbon spools in place and all I have to do is pull out the drawer from it’s base to snip off a length of ribbon. 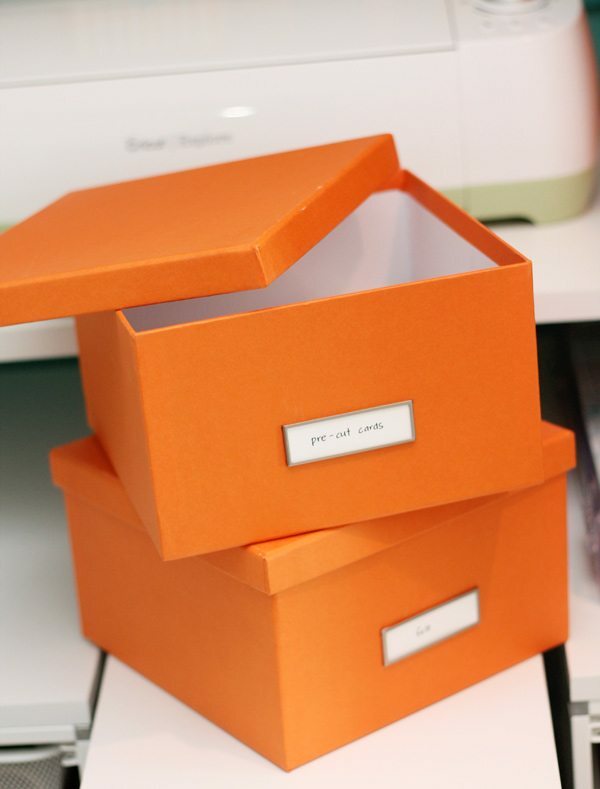 In addition to the clear drawers, I also used Stockholm Magazine Files and Stockholm Photo Storage Boxes to keep things in place. I really love that everything has a home. It doesn’t hurt that these also come in pretty colors. 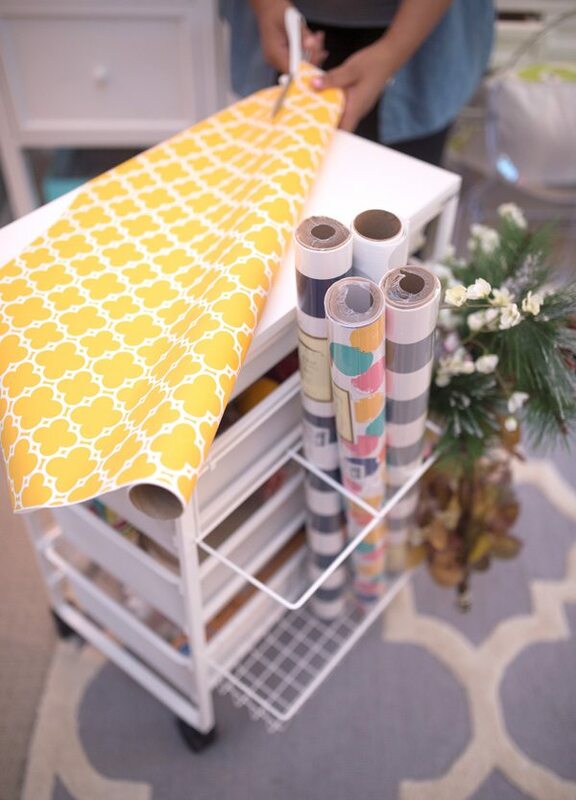 The large Stockholm Desktop File is another great solution for storing cardstock. Not wanting to leave an ounce of unused space, I decided to make the most of the wall behind my sewing machine and Cricut Explore machine. 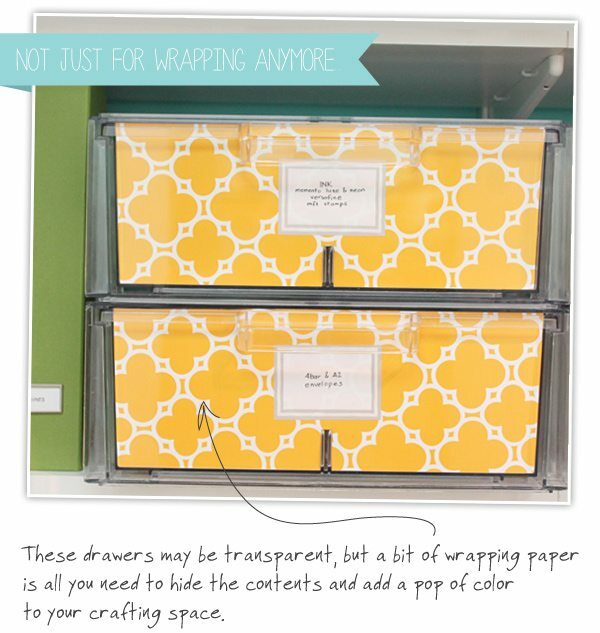 Luckily, if you wander around The Container Store, you will find a solution for everything. That’s exactly what happened here. Urbio Magnetic Modular System can be used in approximately 7 bajillion ways. The magnetic wall plates screw directly into your wall and there are several different containers that you can choose from for storing your goods. For my set up, I chose the Wide Mouth and Shorty containers for holding pens, scissors and notebooks. I love that the containers can be pulled off of the wall plate for me to bring over to my workspace. The Elfa Drawer units are by far the biggest storage solution in this closet. For my closet space, I have a total of six free standing units on wheels; three on each side of the closet. The Elfa Custom Drawer Planner was really helpful in figuring out which size drawer units I should get. By having the drawer units on casters, I’m able to have another workspace, which I love! 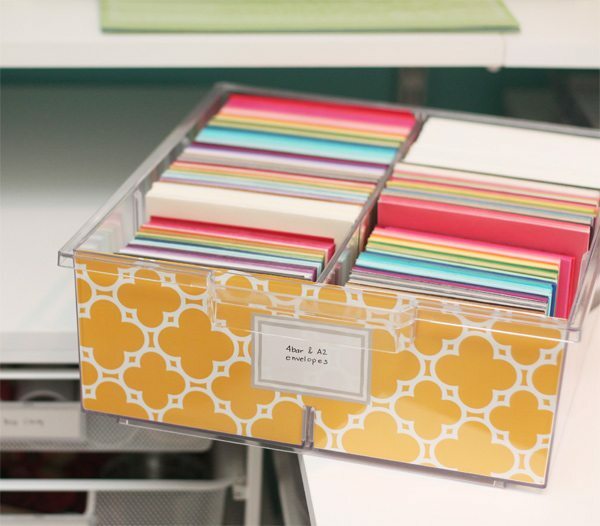 I frequently pull out the middle drawer unit and use the white melamine top for trimming cardstock or cutting ribbon. On one of the drawer units, I added a Gift Wrap Organizer, which is the perfect spot for organizing those large photo props that used to live on the closet floor. Also, whenever I need to wrap a gift, the cart pulls out and provides a great work surface for cutting paper and wrapping up gifts. I have a feeling this will be super useful with the upcoming holiday season! 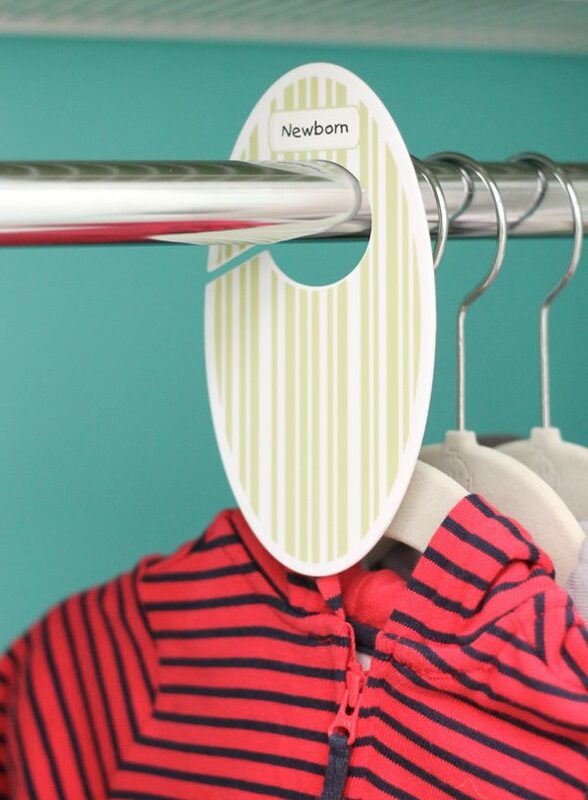 Now let’s take a peek on the baby side of the Crib Meets Craft closet. The Oskar Boxes are incredibly roomy and have given me a great place to store baby clothes that he won’t be able to wear for a while. 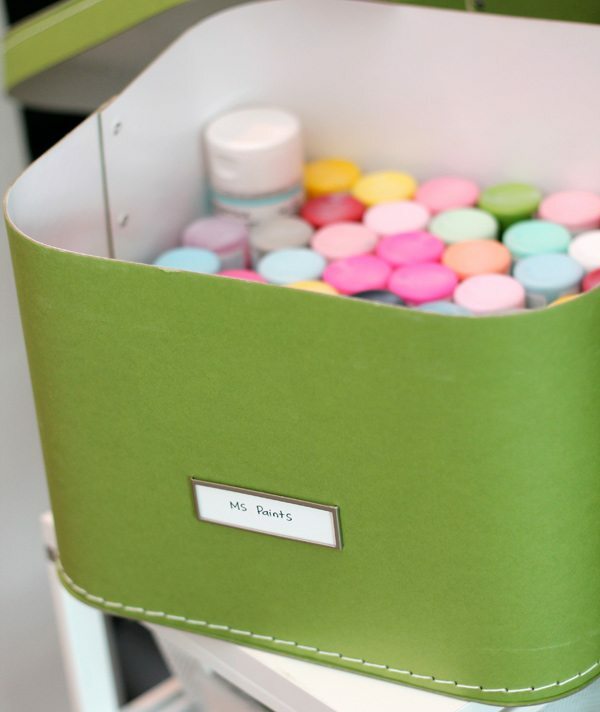 The boxes are also perfect for all those Martha Stewart paints that I seem to be hoarding! Thankfully, the Elfa system allowed me to add a closet rod to this side of the closet even though I didn’t need one on the crafting side. 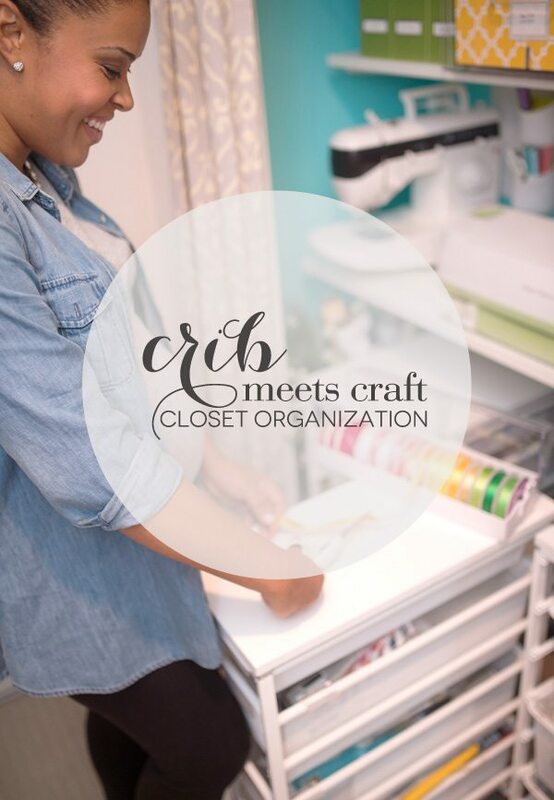 The addition of the closet rod is seamless and it looks like it’s totally belongs there! On the baby side of the closet, I have the exact same drawer units which pull out on casters. 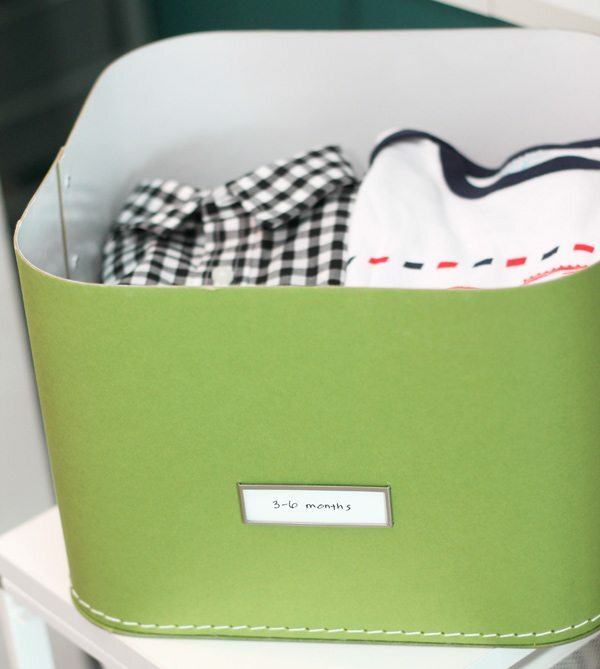 It’s a great place to fold up baby clothes and each of the drawers has plenty of room for all those baby necessities like diapers, hats, socks and shoes. Looking back at those “before” photos, it’s hard to believe that this closet had so much useable space! The amount of supplies that I’ve been able to organize has freed up a ton of space in the nursery so that we can make room for baby! I’d love to hear your thoughts on this makeover and I’d especially love to hear about your own organizational needs! Will you be using any of these ideas for your own space? Do it ! You will be so happy you did. I love that all my supplies have a proper home. It makes clean up SO quick and easy. If you are unsure about which elfa pieces to start with, just schedule an appointment with the elfa designers. They are great. I am particularly partial to the drawer units. They store a ton of stuff! Such an amazing transformation! LOVE it. Amazing transformation! Love how you put together both of your worlds! Thanks for sharing!! This is awesome. I never seen no crib for that baby. But love the way you have the work space set up. Oh, you’ve only seen a portion of the room! There is a totally separate nursery area where the crib, changing table and lots more goodies are! Stay tuned for the second reveal! Wow, Amber! What a great job you and The Container Store have done here. 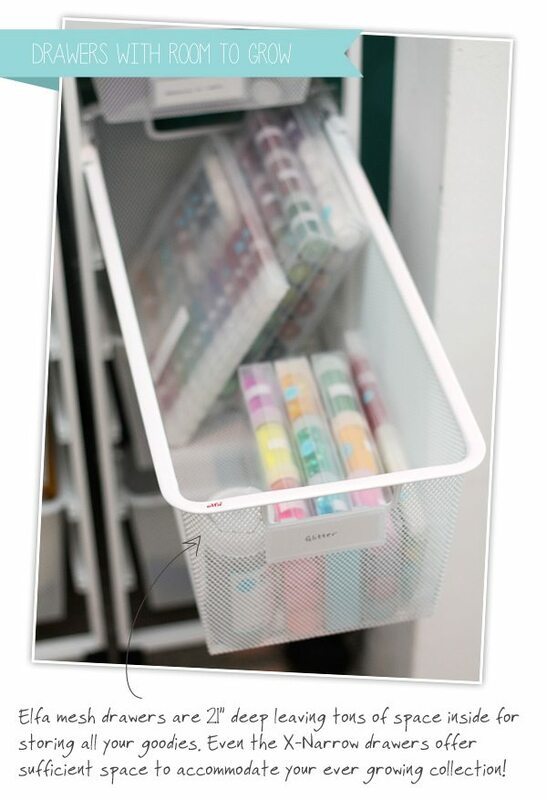 I too have those clear ribbon organizers (6 of them) and am in need of more, but I can’t remember where I ordered them from, would you help with that please? 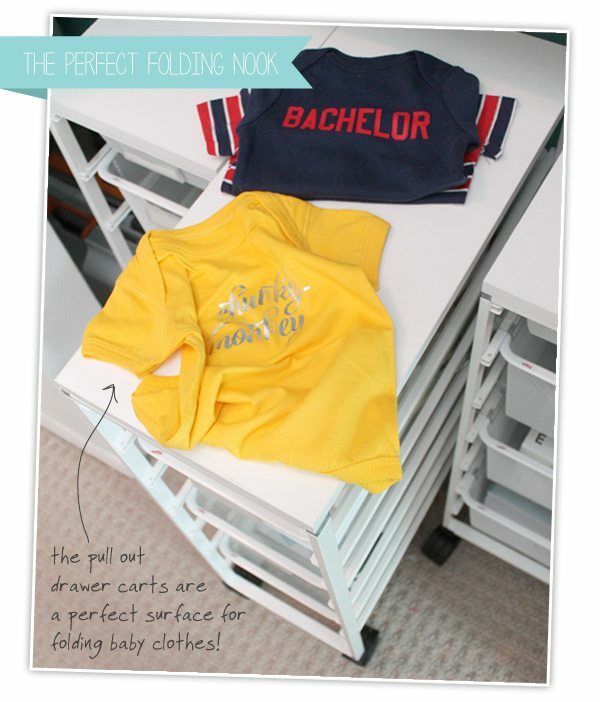 By far, my favorite thing in your Crib Meets Craft post, is your precious BABY BUMP!!!! I love it! There is nothing sweeter, at least until the baby comes! Congratulations to you and your husband on this joyous occasion. I hope you will be able to find time to craft when the little guy arrives. I so enjoy getting your e-mails, I always look forward to seeing what you have created for us. Best wishes to your sweet little family, this Christmas you have something extra special to celebrate! Hey Cheryl! 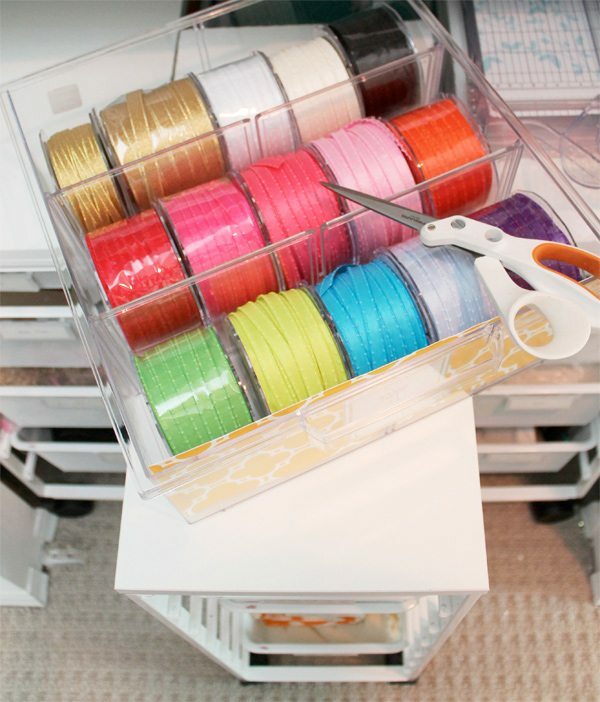 Don’t you love those ribbon organizers!? The ones I have are from The Container Store. I believe the newest model is a bit different that the ones pictured here but they function in a similar way. 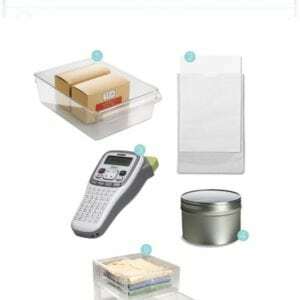 Just go to The Container Store site and search their Gift Wrap Organization section. You’ll find em! Hope this is helpful! It’s beautiful and fun. Congratulations again to you and your new family addition and your great room to have it ALL happen in. Great reveal! Elfa rocks…I so want to be able to do that. But the Urbio system seems really cool, too. Thanks so much for sharing! What a great re-do! 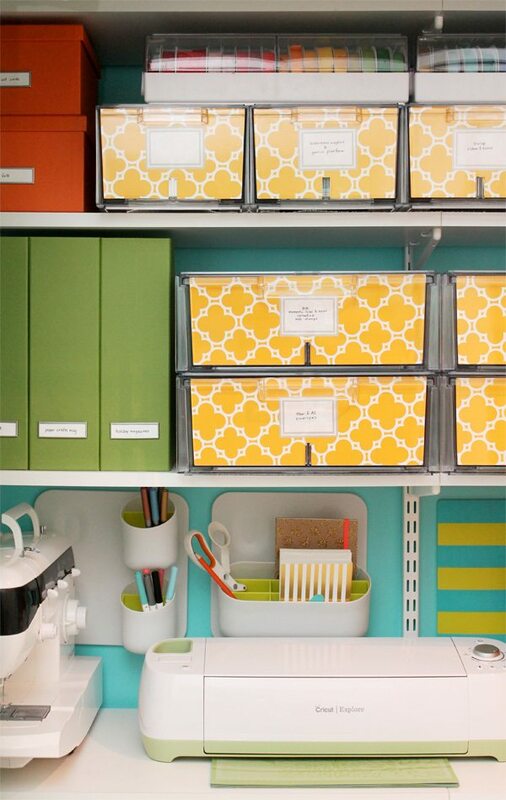 Love how you organize the space. I should have mine re-do as well! You are doing great getting things done before and not waiting to try to work around a new little one. Excited for you, Cannot wait for the family pictures. Wow, this is amazing! I think you have inspired me to make better use of the closet in my craft room. I don’t really have craft supplies in it right now, just all the stuff that doesn’t have a home elsewhere in the house! Getting some of my less often used items into the closet would make my desk space less cluttered. Beautiful transformation! Great space planning! 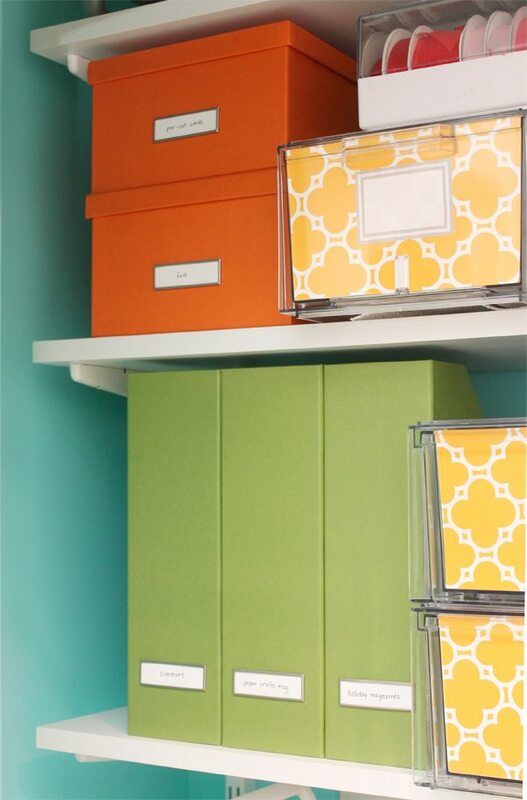 Beautiful colors and awesome organization! Thanks for sharing all of these with us! WOW oh WOW! Can’t wait to see the rest. Makes me want to strip my closet clean and start all over. LOVE!!!!!!! Did you affix the wrapping paper to something stready? Great question! I did. I cut a piece of plain white cardstock to the size I needed and just used a glue stick to adhere the wrapping paper. Really easy and I love how it turned out! Wow I’m jelly ! It looks so great, but it’s nice to know other people have these closet issues too. I’m afraid of how much trouble the container store is about to get me in with the bank account lol. Beautiful! You look radiant! Thanks for sharing this with us. Looking forward to the arrival of the little one! I feel like Christmas came early with this post! Everything looks awesome! I love the Container Store, I literally call it my “Xanax” 🙂 It’s great to see more examples of their products used in such a beautiful way! Very good information. Lucky me I ran across your webgsite by chanjce (stumbleupon). simply beautiful! I’m so jealous. I like the drawers on wheels. May have to add a couple of those. Wow, Amber, you did an awesome job with your Crib Meets Craft redo. 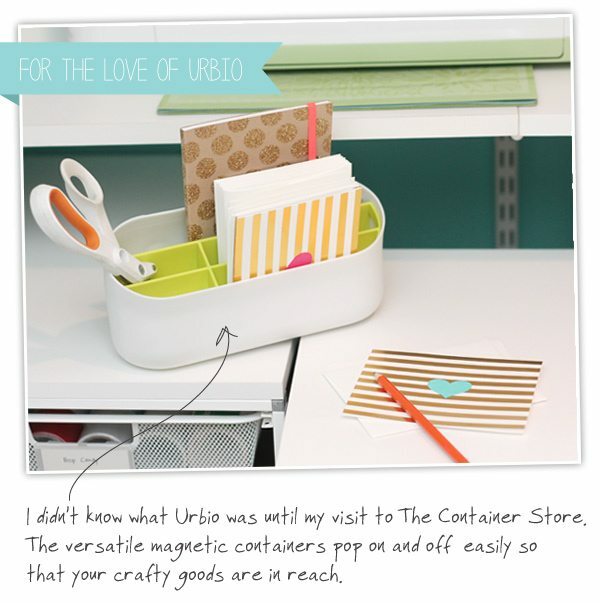 Have been wanting to go to a Container Store for ages, and sounds like now would be a good time. TFS! You look so cute pregnant. Amber…This is Totally Awesome Girl. 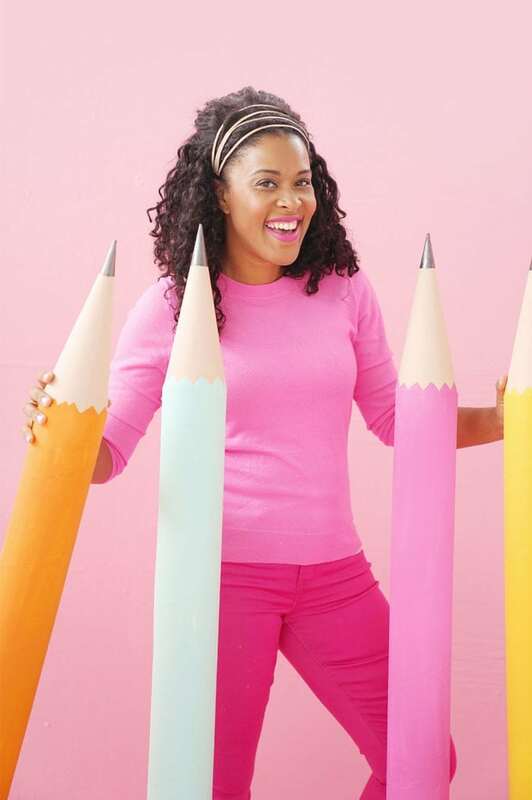 I would love to swap spaces with you now for your Crib meets Craft Space. I could sooo use this. I haven’t crafted in almost 11mo in my craft space since little precious Mookie-Pie arrived. She’s kept us busy. I could use two or more make overs in my craft space for sure and especially the girls (5yr & 11mo) room. Somehow my craft hoarding has spilled over into their room…gasp (hands over mouth in shame). Was this really expensive to do and how long did the whole process take from concept to completion. This may be my only way of recovery before end up on OWN’s new version of Craft Hoarders…(SMH). Hi Felicia! I’m so happy you like the makeover – I am loving it! The process from concept to completion was really quick. Maybe two weeks. The people at Container Store really did all the hard work by designing the space. They make sure you have all the pieces you need for assembly and in my case, they delivered everything and installed it. If you want to install it yourself, you can totally do that! I’ve installed elfa before and it’s not difficult for a space like this. As far as cost, I was able to cut costs down a lot by reusing elfa pieces that I already owned from my previous craft space setup. Thankfully, elfa is really versatile and can be moved and reused from one place to another. The only pieces I had to bring in were the drawer units, closet rod and a few additional white shelves. The final cost will really depend on the size of your particular space – and honestly, you can really work with any budget. Also – if you go into The Container Store and design a space with the elfa consultants, they will save that design for you indefinitely so that you purchase the pieces over time rather that buying all at once. And of course, you can always wait for one of their sales. They have one going on now and then another one that will happen in January! Hope this is helpful info. Let me know if you have any more questions! Wow, wow, wow!! 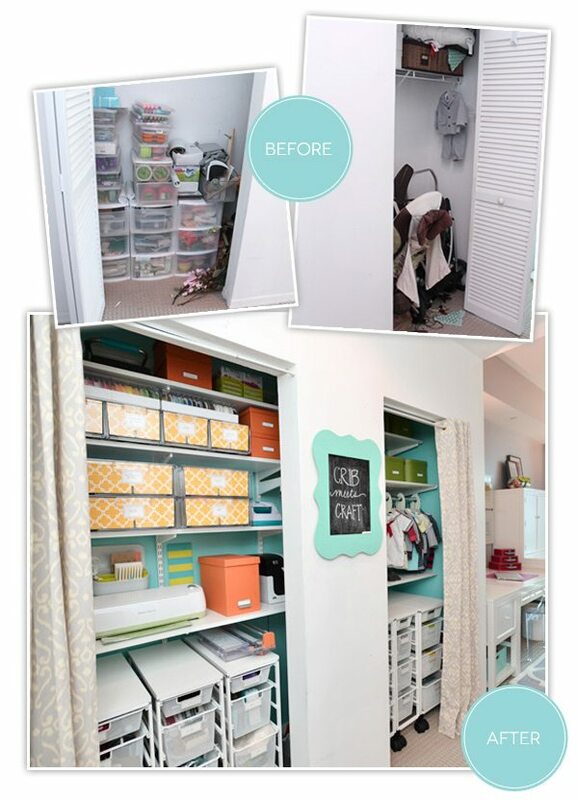 I love this closet makeover! You’ve inspired me now, haha! I really like how you took the folding doors off of the closet and have curtains instead, looks fab! EVERYTHING looks fab!! Love your new closets they are so clean looking and efficient. 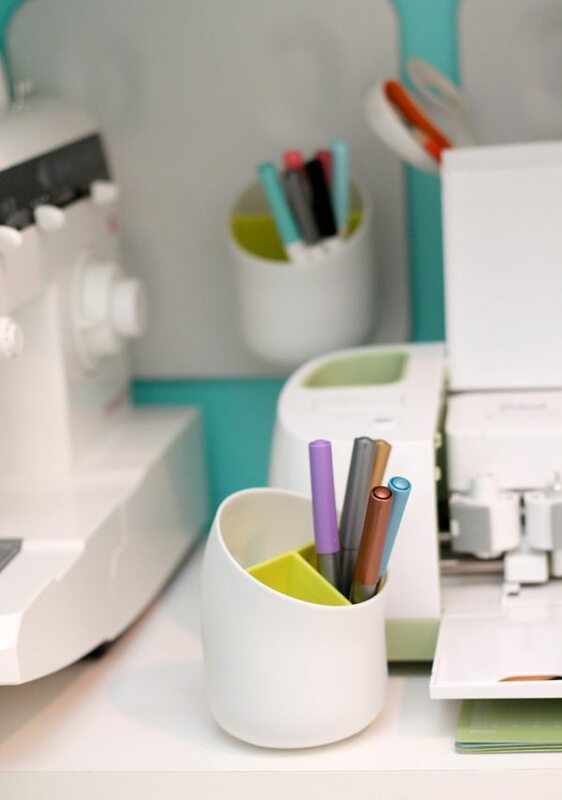 How fun you are able to combine your craft space with the babies room. Congratulations and job well done.